My local in Ipswich (Queensland) is the Coronation & I promised its publican I would have a beer in namesakes if I came across them. So here I was, boring the bar bloke with my story. He was a patient fellow & served me a pint of Doom Bar (2.80), which was satisfactory. The madness of the Ship a couple of kilometres away had migrated here, with several punters tending to intoxication mid afternoon. What is it with Bristol on Mondays? No longer a Hopback pub, but still has Summer Lightning. Also sells Butcombe and Doom Bar. Good range of ciders, including Thatchers traditional and cheddar valley. 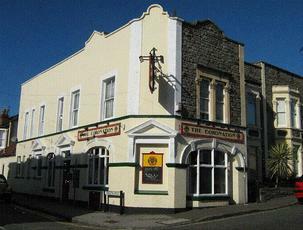 Now a very inexpensive pub, and much more hospitable than it used yo be. To their eternal discredit, Hop Back have now abandoned the Coronation to its fate - which is as a bargain basement, quantity-before-quality purveyor of cheap national lagers and ciders under new but hardly enterprising management. A sad loss to local beer drinkers who are unlikely to be tempted in by mediocre Courage Best. Back to the future indeed. Walked here from the Orchard as part of a pub crawl from Hotwells on the 27 Dec 2010 and despite the rain I was glad that I had made the effort. Internally a single bar operation, this is a pleasant but unremarkable pub, a little tired. 5 out of a possible 6 beers were on from Hopback Brewery plus Bounds Scrumpy from Westons on handpull and Wersteiner lager. The locals and the lad behind the bar were friendly and the beer was in good condition on my visit on the 27th Dec 2010. Will someone buy the pub a new carpet?!! !